Range of modern appliances for the kitchen is huge, allowing you to choose the right product for any functions. However, to avoid mistakes when buying such devices, you need to understand the difference between them and the purpose of each of them. Blender is primarily designed for the manufacture of mousses, drinks, purees, and also for mixing different foods and liquids. By construction, these products are of two types – fixed and submersible. In the first case a blender is a bowl with a nozzle with a knife at the bottom. In this bowl put the products, or pour liquid, then close it with the special cover and include. Immersion blenders represent an elongated rod with a nozzle which is lowered into the bowl of a food or liquid. Often blendery nozzle is included with a food processor. It can be considered as another type of such device. The chopper consists of a reliable shock resistant bowl and stem, on which are mounted various attachments. The number and functions of the nozzles depend on the characteristics of a particular model. In particular, it is possible to buy a device with the function of the rasp, small, medium, large shredding, etc. A very important difference between a blender and a chopper is in their design. The first device, the nozzle located below the second top. Thanks to this feature, the blender thoroughly mixes food, turning them into a homogeneous mass, while the chopper cuts them and lays down in the bowl. Outwardly these devices vary greatly. 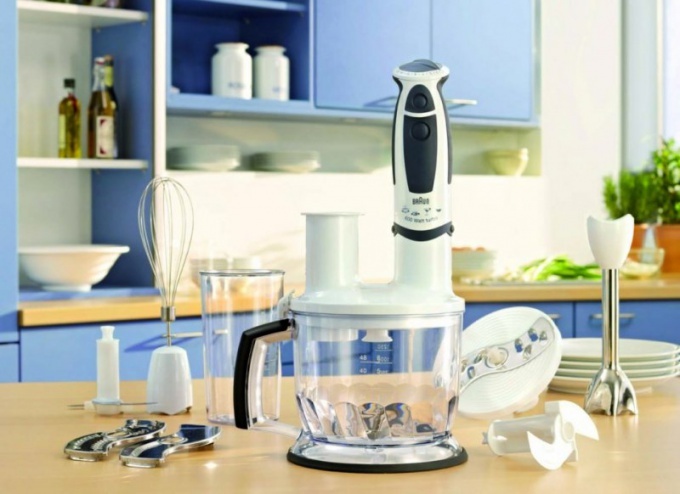 Typically, the blender is higher and much narrower than the corresponding element of the chopper. The difference lies in the purpose of devices. If you need to mash or emulsion, soup of pureed vegetables, cocktail, the best choice would be blender. Thanks to him you can also whip the cream, mix the sour cream with fruits and berries, cooking light mashed potatoes for the baby. If you need to cut or RUB products, this task will cope better chopper. This device runs more roughly than blender. With its help it is easy and convenient to prepare salads, vegetable mixture for a roast. According to the principle of chopper resembles a grater or a knife, but allows you to cope with the task much faster and better, provides a uniform cutting. Note that some models of shredders are complemented by tips for grinding products, mixing liquids, preparing and whipping mashed potatoes. Such models are in some ways reminiscent of blenders, but the feature set is much wider, and the price is usually higher.